The Rosa Alpina Hotel & Spa has revealed their new penthouse, with interiors created by Italian design studio, Vudafieri-Saverino Partners. Tucked away in the heart of the Dolomites mountain range, the Rosa Alpina Hotel & Spa is a well-known symbol of Italian hospitality and excellence. 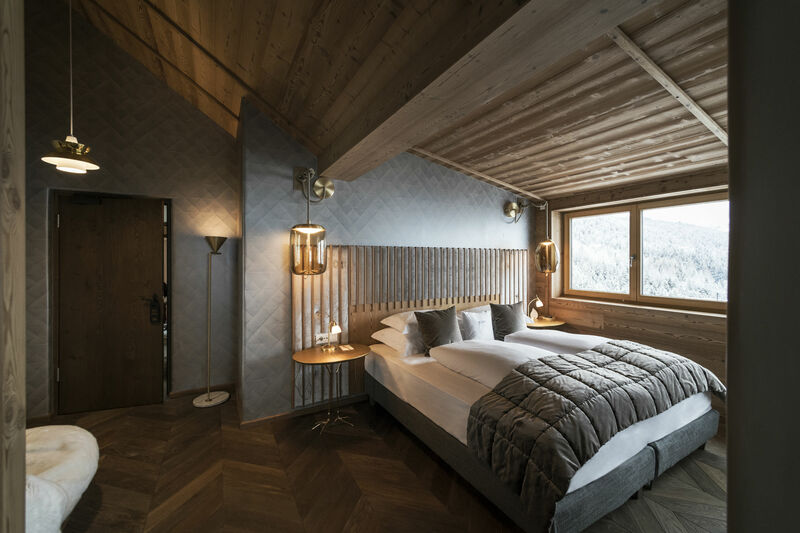 A member of The Leading Hotels of the World group, the Rosa Alpina is situated within the small village of San Cassiano, and boasts a three-star Michelin restaurant, as well as a recently refurbished Spa. However, it is not these elements that have brought Rosa Alpina back into the limelight recently; the five-star luxury hotel has recently announced its new penthouse, with interiors created by Milanese design studio Vudafieri-Saverino Partners. The new penthouse project renews the collaboration between Vudafieri-Saverino and the hotel, which dates back to 2008 when the interior design studio created 10 suites for the resort. 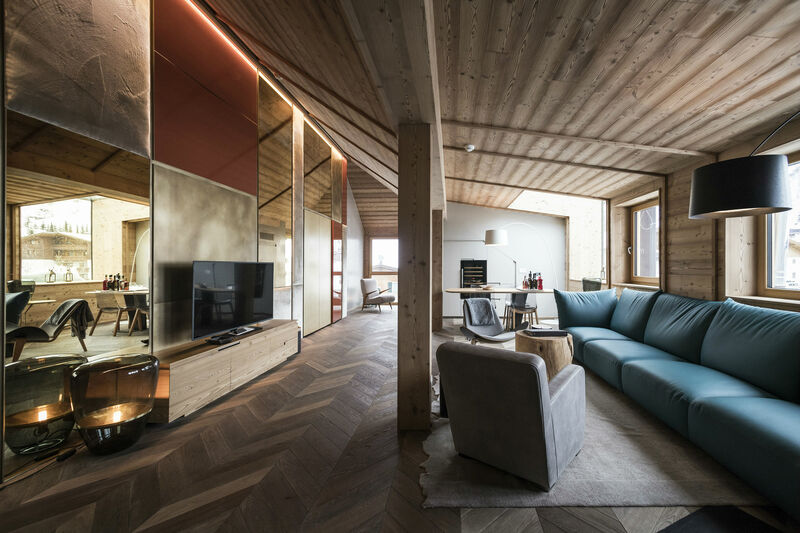 Situated on the fourth floor of the Engelstrakt wing of the Rosa Alpina, the new 160 square metre penthouse is comprised of three suites, a bar and kitchen area, and a large lounge area with glass panel windows that overlook the mountains. 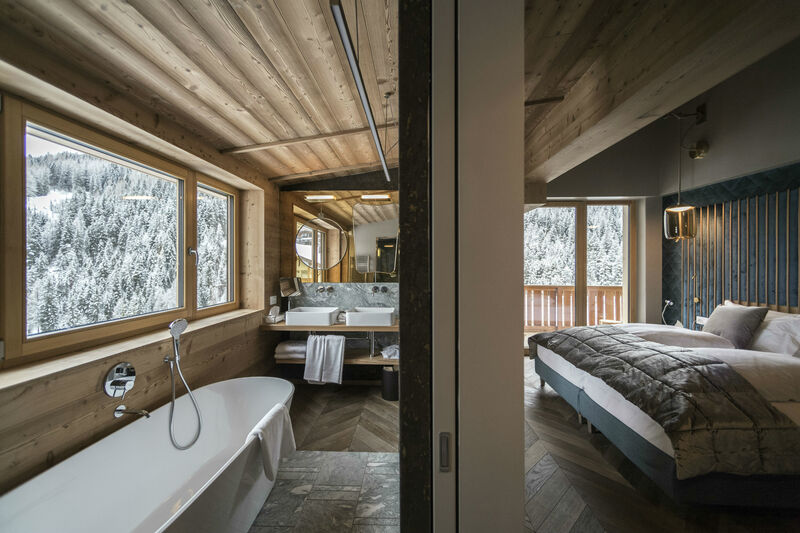 Each of the bright, open spaces has extraordinary views of the majestic Dolomite Mountains, meaning guests can enjoy the natural landscape surrounding them without even needing to step outside. 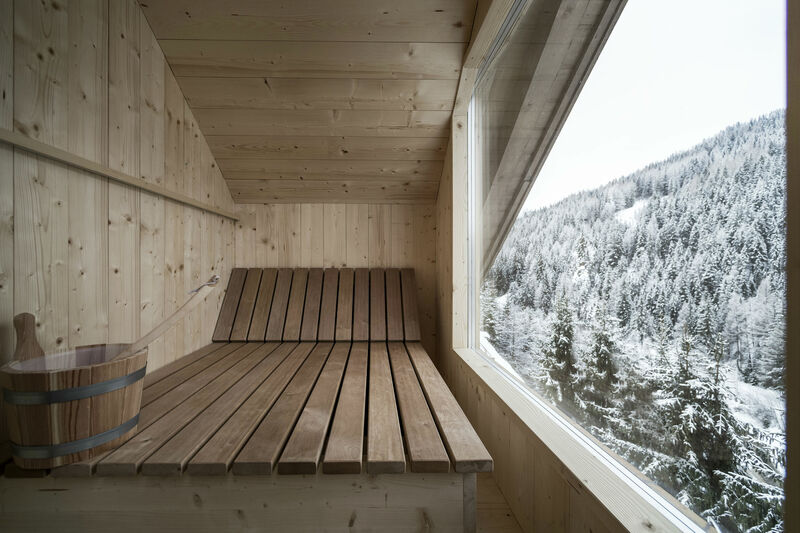 Another element that makes the new penthouse a stand-out luxury hideaway is the private wellness area within the space; here, guests can relax and unwind whilst experiencing the Alpine views outside. Having worked with the Rosa Alpina previously, Vudafieri-Saverino Partners were well placed to understand the needs of the penthouse, and how to create some stunning interiors that fit with the hotel’s brand. Headed by architects and founders, Tiziano Vudafieri and Claudio Saverino, Vudafieri-Saverino Partners have created a “reinterpretation of tradition” throughout the Rosa Alpina penthouse. With the location’s identity and traditional materials in mind, the team have designed contemporary interiors that mix elegantly with the hotel’s heritage. Throughout the penthouse, Vudafieri-Saverino Partners have gathered an array of high-end quality furniture to make the most luxurious interiors. Guests can expect to find pieces from world renowned designers including Tom Dixon, Carl Hansen & Son, Edra and Driade. 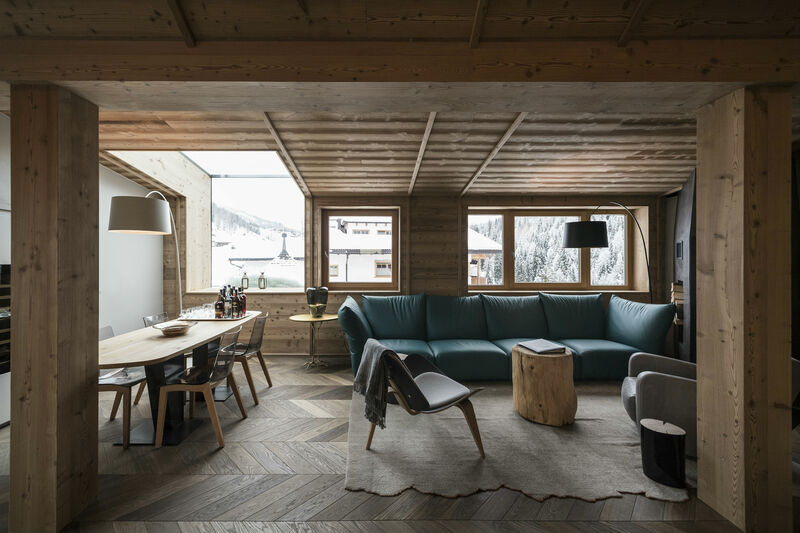 The design studio also overcame the challenge of each room being dominated by wood – a traditional material used in mountain building construction – with the new pieces adding sophisticated elegance and splashes of colour. The attention to detail within the penthouse, partnered with the bright, open spaces and incredible views, prove that the Rosa Alpina Hotel & Spa’s new penthouse is a welcome addition to the five-star resort. Vudafieri-Saverino Partners have created an elegant, luxurious space with carefully crafted interiors, which guests will certainly enjoy all year round.